Everyone and their grandmother live tweets the Oscars. It's just a thing that happens nowadays. We all love following along and seeing who is saying what we're all thinking. One person, we were not expecting to live-tweet the awards (and slay) was the child star, Macaulay Culkin. The Home Alone actor joined social media only recently, and he let us all know that he would be live-tweeting the Oscars, but with a catch: He wouldn't be watching them. 1. Macaulay Culkin just got social media?! 2. How is this going to work? It soon became pretty apparent that Macaulay was actually watching the Oscars, and as the awards got underway, he threw some shade at host Jimmy Kimmel. This is a serious question that we all need to be answered immediately. Mac also posted several activities that he was doing to make us all believe that he wasn't actually watching the award show, but we knew the truth, Macaulay. We knew. Did you make enough for the class? We could have used a mid-show snack. He even made some wild predictions about who the winners would be while also informing us of his film knowledge (or lack thereof). Does anyone actually know the answer to this? If you could just let us all know, that would be great. Macaulay may have mixed up the Oscars with the Nickelodeon Kids' Choice Awards, but that also gave us an idea for how they should spice up the Academy Awards. Who wouldn't want to see Meryl Streep with a bucket of slime all over her? Mac was seriously tweeting exactly what we were all feeling, because this was probably the biggest upset of the entire year. It's like when you're expecting Goblet of Fire and you accidentally put on Chamber of Secrets. He was clearly up to some very serious business while he was "not" watching the Oscars. This is something that definitely couldn't wait until the next day to do. Keep those feet fresh. Snaps for shouting out the real MVP. I don't understand how this wasn't even nominated for a single award. The Academy really needs to take a look at themselves in the mirror and think about those they are hurting by leaving them out of the awards. We were also here for his recognition of a certain Canadian pop star who never gets the praise she deserves. This would been a major plot twist that would have made for the greatest awards show of all time. Macaulay also may have overshared a little too much, but we were definitely on his level. Let's be real. Don't we all wish that J-Law could be in our lives? If you say no, you're a liar. TBH, we would have skipped watching the show entirely if it meant we could play toys with Macaulay Culkin. At least he is having all of the fun, and that's what's important. He even gave a shout out to rumored girlfriend Brenda Song in the most genius way possible. Get yourself a man who slips your name into a fake Oscars prediction on Twitter. Macaulay also had his soul crushed when the incredibly popular and Oscar-worthy (not!) film The Boss Baby did not end up taking away the trophy for Best Animated Feature. We seriously wanted it to win just for kicks. We're savage like that. Full disclosure, we were shocked too. Honestly, if Macaulay wasn't live-tweeting the awards show the whole time, we would have started to become seriously concerned about his well-being. He was also very upset with the winner for Best Picture, The Shape of Water, for a very acceptable reason. Mac's not wrong here, this was a massive plot hole in the film that should have been addressed. 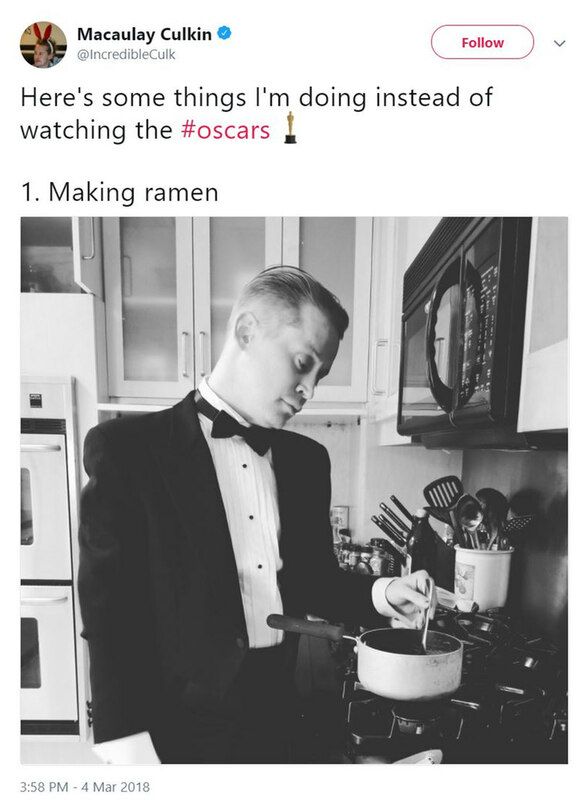 The Oscars may be over, but now, we have many more tweets from Macaulay to look forward to. It's the gift that keeps on giving. Were you following along with Macaulay Culkin on Twitter? SHARE if you think Macaulay should live-tweet every single event until the end of time.